Jett Foundation celebrated its 2nd Annual Shine a Light on Duchenne Gala at the State Room in Boston on Thursday, January 25. With 260 guests in attendance and the support of 18 sponsors, we raised $200,000 to support the Jett Giving Fund. The Jett Giving Fund is our matching gift program that assists families affected by Duchenne muscular dystrophy who are struggling to afford specialized equipment like accessible vehicles, scooters, and rotating beds. The stage was set by our energizing, and often comedic, emcees: Liz Brunner, Lenny Clarke, and Johnny Pizzi. They welcomed Jett Foundation founder–Jett’s mom–Christine McSherry to the podium to kick off the evening’s program. Jett Foundation founder Christine McSherry, with Beacon Award winner Candy O'Terry, and emcees Lenny Clarke, Liz Brunner, and Johnny Pizzi. President & CEO of the Boys and Girls Clubs of Dorchester Bob Scannell, Chef Paul Wahlberg, Jett Foundation Founder Christine McSherry, and Boston photographer Bill Brett. Boston’s own beloved photographer, Bill Brett, was welcomed to the stage to present his namesake award, the Bill Brett Spotlight Award, to a longtime Jett Foundation supporter, Paul Wahlberg. Chef Wahlberg executive chef and co-owner of Wahlburgers and Alma Nove. Candy O’Terry, president and co-founder of Boston Women in Media & Entertainment, was also honored with the Beacon Award. 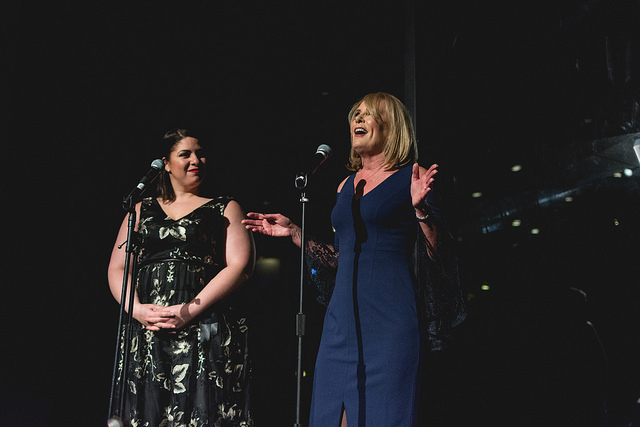 After accepting the award, Candy and friend Sherée Dunwell performed an incredible rendition of “For Good” from the broadway hit musical Wicked. All proceeds of the single’s sales will benefit Jett Foundation. The song can be purchased for $2.99 at cdbaby.com/cd/candyoterry2. Sherée Dunwell and Candy O'Terry performing "For Good." Just before the start of a lively auction, guests were reminded of the transformational impact of the Jett Giving Fund through the premiere of the Jett Giving Fund film, “Hopes and Dreams.” The film took viewers into the lives of two Jett Giving Fund recipient families, the Gaudenzi and McGourty families. Their personal stories left the room inspired to make a difference in the lives of the families we are working to serve in the upcoming year. Special thanks to our lead sponsors: cm&b, Sarepta Therapeutics, Yale Appliance + Lighting, and an anonymous Angel sponsor who covered costs for our families to attend the gala. Thank you to Mary Chiochios and her team for their inspiring storytelling in the evening's short film–"Hopes and Dreams."